As Unitarian Universalists, we care deeply about our beliefs. So deeply that we don’t want to say the words “I believe” unless we truly believe! We are humbled by life’s great mysteries. What does it mean to be human? Do we have a purpose? What happens when we die? We accept that some mysteries could be beyond our human ability to experience, comprehend, or express in a way that satisfies everyone. Accordingly, we don’t impose a set of beliefs on our members. Except for the belief that only individuals can decide how to describe what they believe. Each of us needs to understand in our own way. Our Unitarian Universalist religion helps us support each other in the search for personal answers. 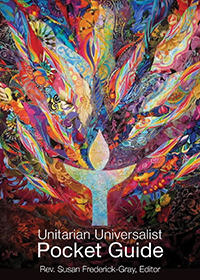 These seven Principles and six Sources of the Unitarian Universalist Association (UUA) grew out of the grassroots of our tradition, were affirmed democratically, and appear in the Bylaws of the UUA. They are part of who we are. They are not dogma or doctrine but rather a guide for those who choose to join and participate in Unitarian Universalist religious communities. These principles and sources of faith are the backbone of our religious community. They are expressed more simply as our Kids’ Principles. We occasionally offer a class called Developing Your Own Theology. It encourages clarification of beliefs. At the end of the program, each participant develops a “credo,” or statement of belief. You might be inspired by some of our members’ credos. As the credos illustrate, at Starr King Church we differ in our expressions of belief. But we are united in our broad and inclusive outlook and in our values. We are united in shared experience: our open and stirring worship services, religious education, and rites of passage, our work for social justice, our quest to include the marginalized, our expressions of love. We work toward a loving community and a faith that agrees with knowledge.